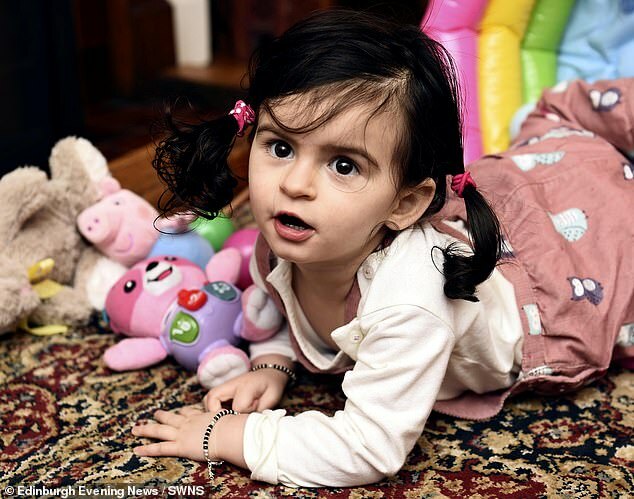 The family of a toddler with a one-in-a-million condition that gives her episodes of paralysis are trying to raise money for groundbreaking research. 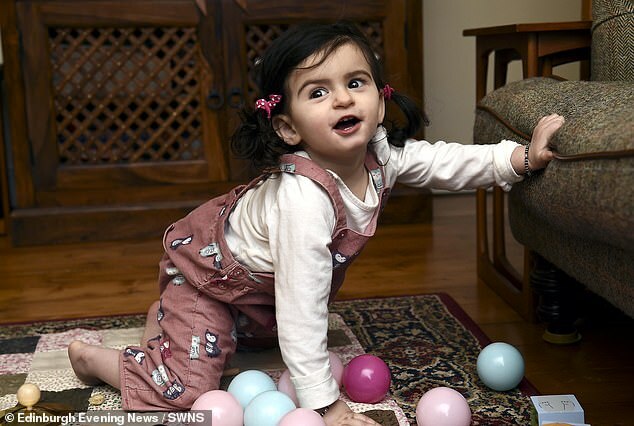 Anya Behl, who is 18 months old, was diagnosed with alternative hemiplegia of childhood (AHC), a neurological condition which can cause numbness or full loss of feeling and movement. It took four months for doctors to figure out what was wrong with Anya’s after her first stroke-like episode at ten weeks old. 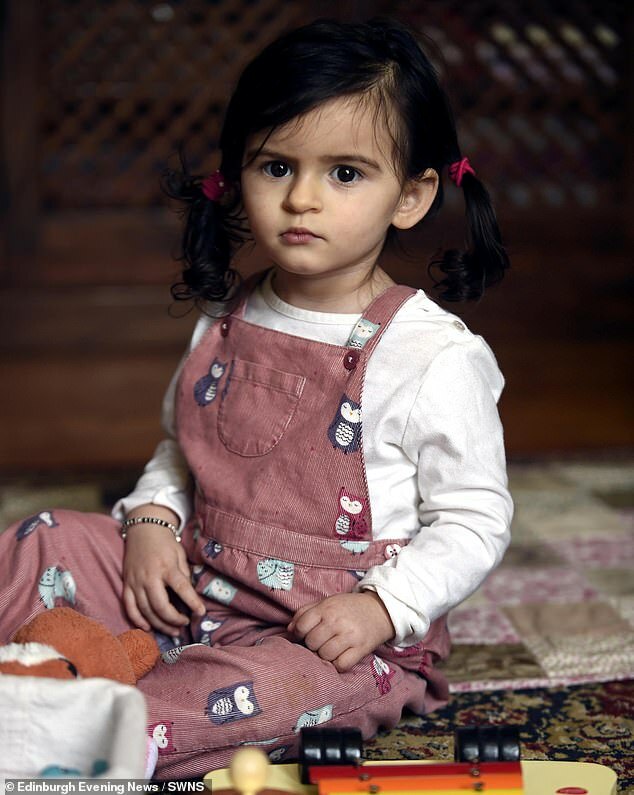 Her parents, Abhishek and Katherine Behl, from Edinburgh, were terrified as her eyes flickered and she let out a ‘terrible scream’. Now, they live in fear an attack will strike at any moment, and won’t leave Anya’ side. There are around 45 families in the UK and 500 worldwide coping with the rare condition, which has no effective treatment. Mr and Mrs Behl are trying to raise funds of £25,000 to help US researchers find a cure. The couple’s lives were changed forever in October 2017 when they rushed Anya – who looked like she was having a stroke – to the Royal Hospital for Sick Children. Mrs Behl, a hospital doctor, said they thought their daughter ‘was going to die’. She said she knew what was going on medically – but as a mother, she felt ‘helpless’. 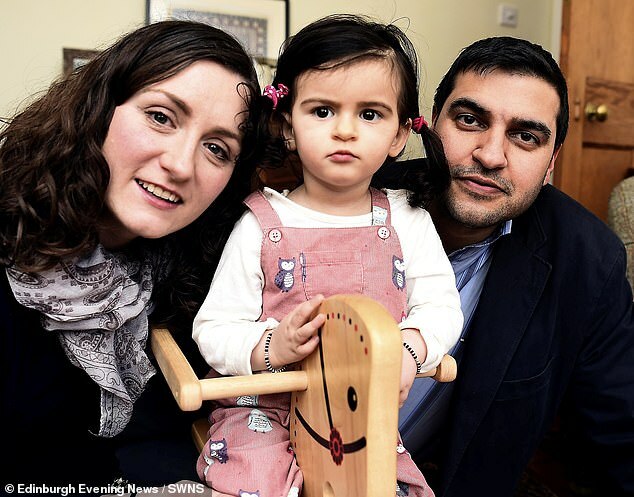 After four months of tests and thinking that Anya was suffering from epilepsy, the couple were told her daughter had the ATP1A3 gene, which is responsible for around 76 per cent of AHC cases. 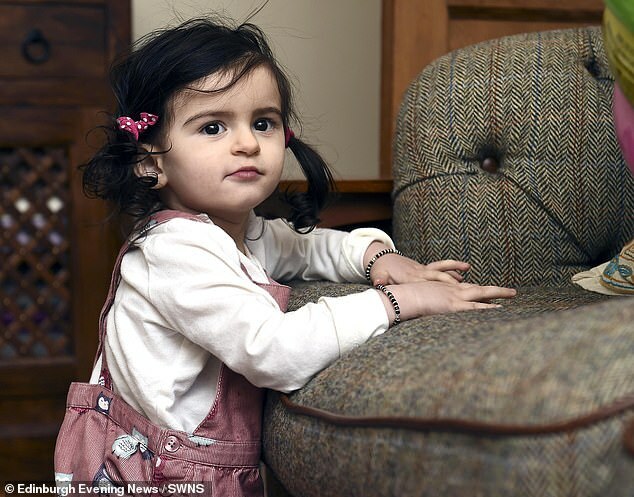 Anya is one of only two children in Scotland with the condition, and according to the Alternative Hemiplegia of Childhood Foundation, the incidence of AHC is estimated at roughly one in 1,000,000 births. But they say the true incidence may be higher since the disorder is commonly misdiagnosed due to the ‘lack of awareness’ about AHC. Mrs Behl said: ‘When she’s paralysed down one side, but not in her worst case, it’s heartbreaking to see her try to crawl when she can’t balance unable to move one side or support herself. ‘Almost all children with AHC have physical, cognitive and developmental disabilities across a spectrum. The AHC Foundation say there is no proof that the disorder limits life expectancy, but that children do appear more susceptible to complications such as aspiration, which can sometimes be life-threatening. In rare cases, children have died suddenly and unexpectedly, in circumstances similar to the sudden death reported in patients with epilepsy. The couple is hoping to raise funds for a groundbreaking gene therapy project in the US for people with the ATP1A3 gene. The funds would progress research towards a pre-clinical, non-human trial to be conducted with the support of several AHC foundations in the US. The trial is essential before ethical approval can be sought with a view to testing the gene therapy in humans. 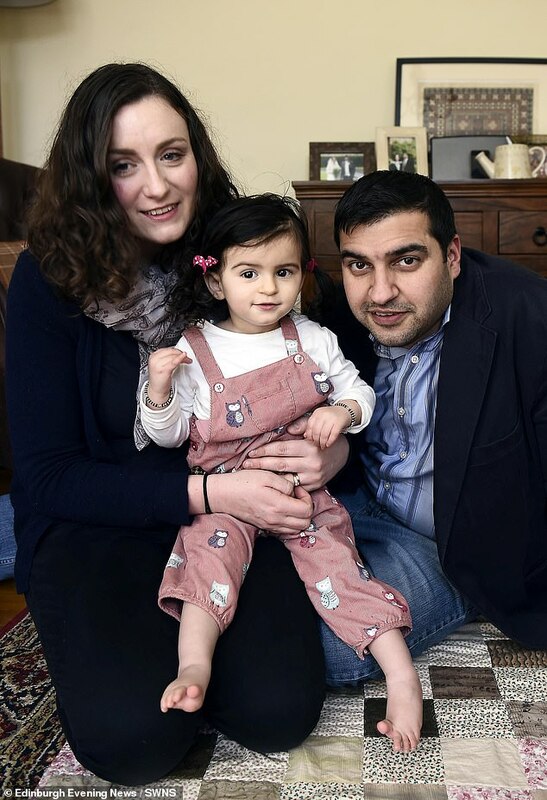 Mrs Behl said her Anya’s condition has taken an emotional toll on the family, with her husband quitting his job as a travel consultant to look after Anya, who has breathing difficulties, full time. She said: ‘We just have to live truly in the moment and enjoy a good hour or good day or even enjoy her being able to eat breakfast without paralysis or distress rather than think of the whole picture. ‘At first we used to get anxious waiting for the next episode to hit not knowing what might come. But we realised it wasn’t sustainable to live like that. Even days out with their young daughter involve stringent preparation in case a seizure takes place. Mrs Behl, who said the condition effects everything they do, said: ‘We don’t leave home without her emergency medications. ‘Our nappy bag includes her emergency medication and a paediatric face mask should we need to help support her airway if it affects her breathing. The AHC community have until April 2019 to raise the money. Anya’s JustGiving page can be found here. Alternating Hemiplegia of Childhood (AHC) is a rare neurological disorder in which repeated, but short-lasting, attacks of partial paralysis (hemiplegia) occur. AHC usually affects only one side of the body, but sometimes it can affect both sides. Episodes can range from simple numbness in an extremity to full loss of feeling and movement. An attack may last for minutes, hours, or even days, and can normally be relieved by sleep. The incidence of AHC is estimated at roughly one in 1,000,000 births – only about 300 people in the US have been diagnosed. Those affected don’t grow out of the disorder, but episodes may change and sometimes even decrease in frequency as a child gets older. In 2012, researchers identified the ATP1A3 gene as a leading cause of AHC – representing about 76 percent of those affected. Currently there is no cure for AHC but researchers are working to identify drugs or drug-like compounds that are capable of restoring normal gene function. The drug Flunarizine – an adjuvant of epilepsy therapy – has been shown to reduce the severity of paralytic episodes, but not necessarily the frequency.